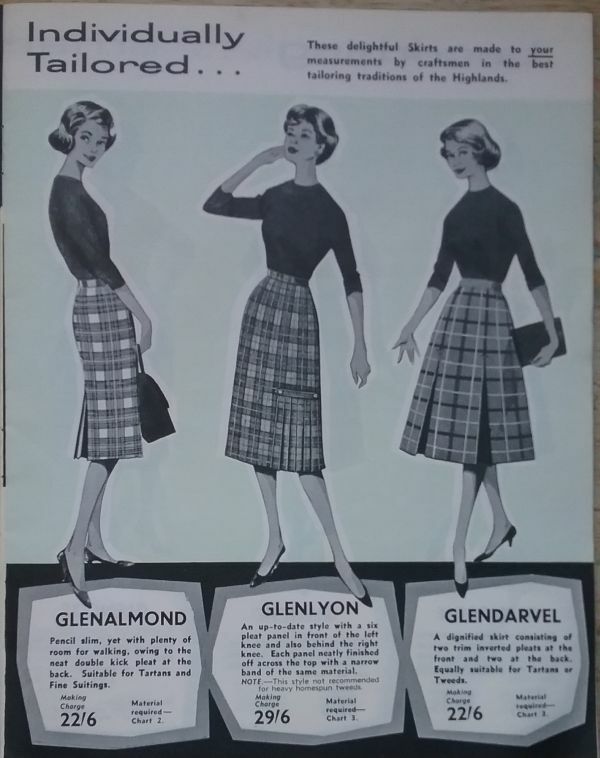 Today I wore a skirt I made from Pendleton Black Watch plaid, and that reminded me that I had not talked about a group of brochures I have that advertise Scottish plaids and woolen knits. McEwens was actually a department store which operated for nearly 150 years before closing in 2016. 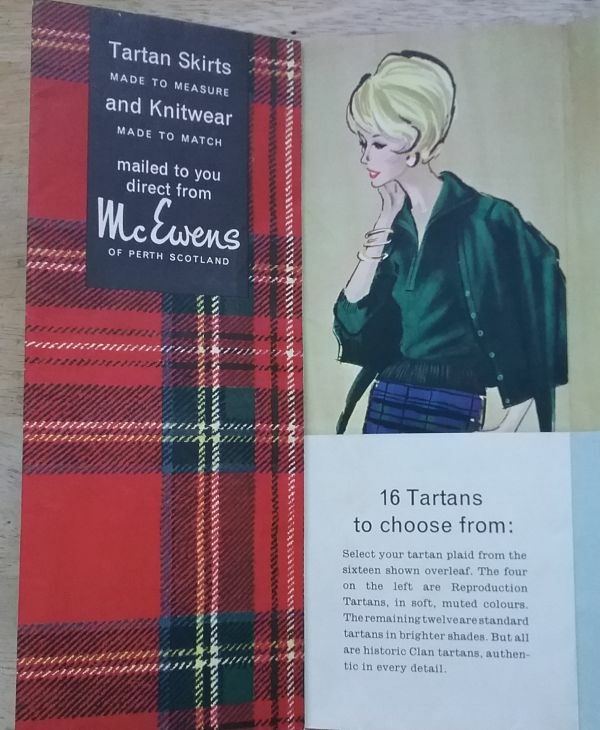 McEwens had a feature that people today would consider to be a real luxury, but which was fairly common in nicer departments stores in 1961. That feature was a department that made clothing to order. 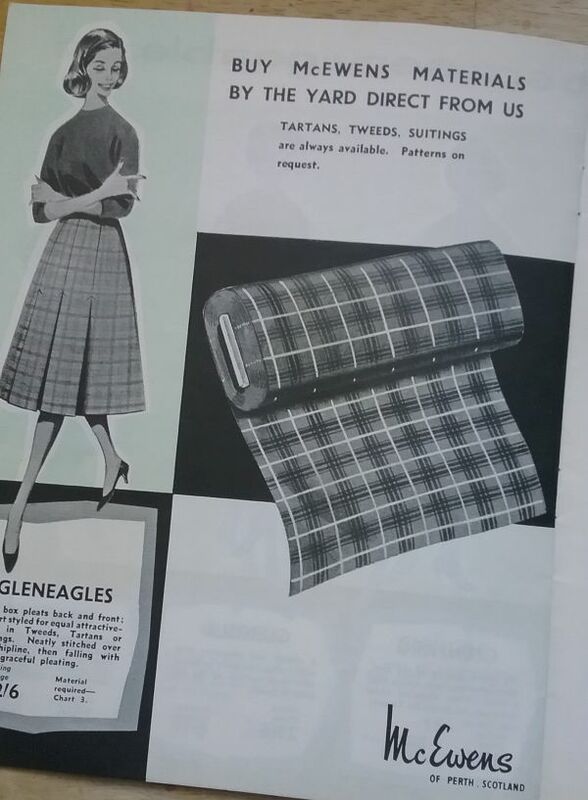 My brochures are advertising skirts made from wool. 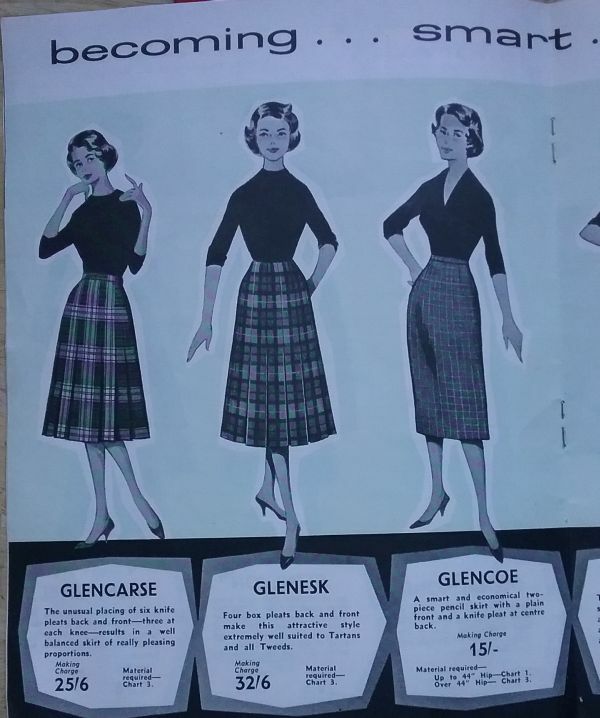 There were sixteen skirt styles from which to choose, and sixteen different tartans. A buyer would fill out the order form which asked for the correct measurements. She would then order either a waistband or a petersham waist. She could order pockets for an additional charge. The item was truly made to order. All the style names start with “glen”. The prices quoted beneath each style was just for the sewing charge. The fabric had to be bought for an additional charge. If you wanted a truly coordinated ensemble, you could buy your sweater from McEwens using this handy chart that told which sweaters would match. I really love the Black Watch skirt above with that deep green twin set. You probably gathered that because I have it pictured three times. 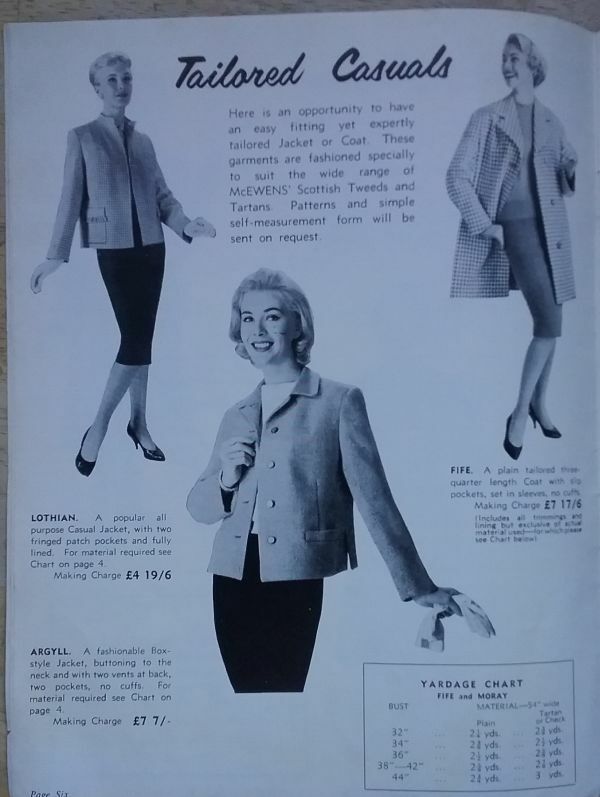 The custom department at McEwens also made other garments, like these coats and jackets. Note how much more it cost to make a jacket than a skirt. 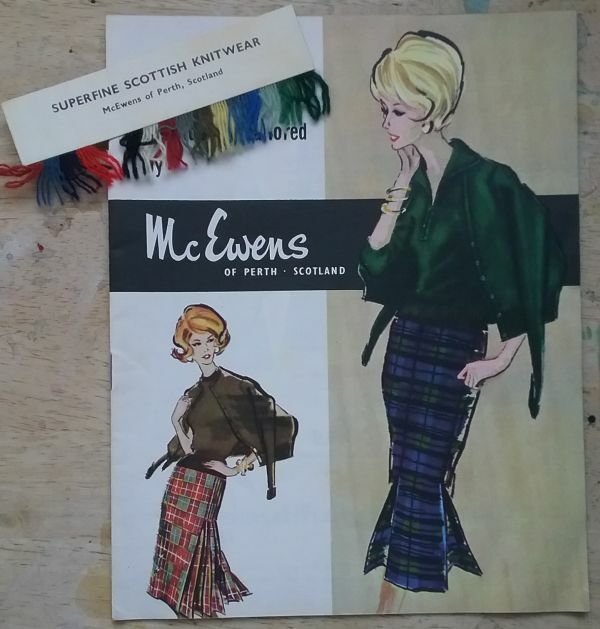 For home sewers, McEwens sold the fabric by the yard. 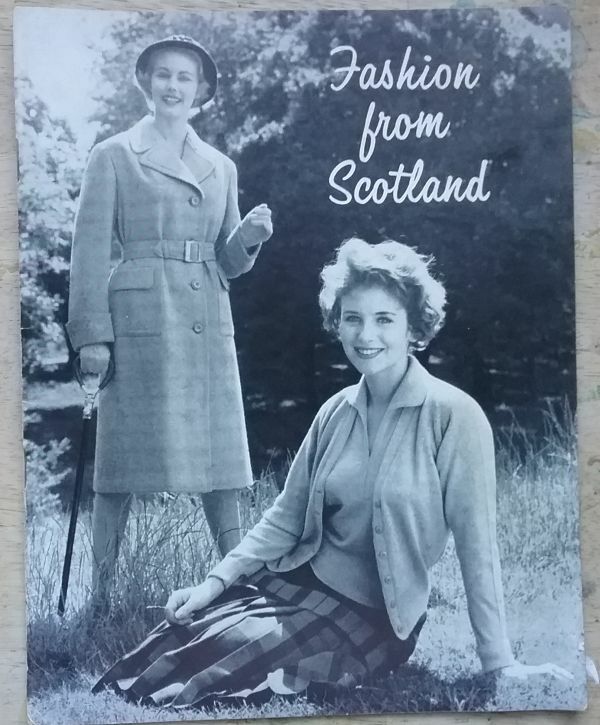 This catalog showed some of the made-to-order items along with what might be considered the types of items tourists visiting Scotland were looking to buy. Things like kilt pins, tartan neckties, and tartan scarves. 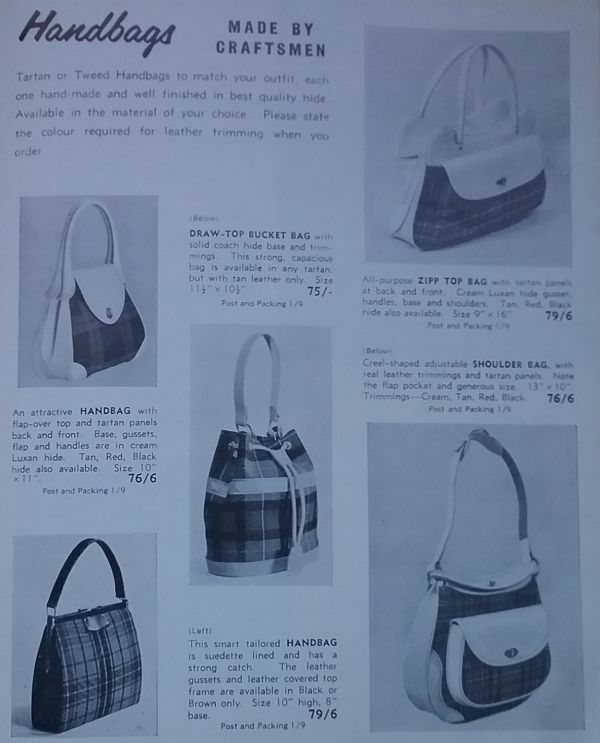 A shopper could not only choose the style of handbag, but also the tartan used and the color of leather trim. I can’t imagine what this would cost today, but the best that I can figure, these cost approximately $120 in current dollars. 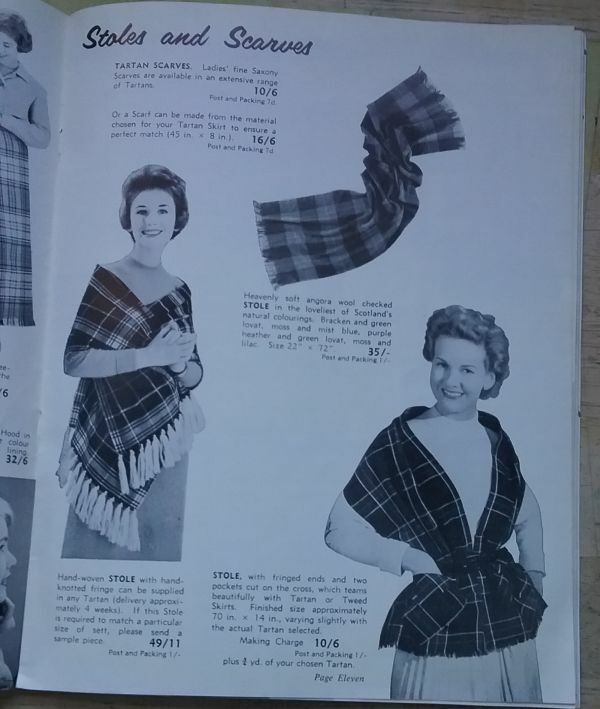 I find so many vintage tartan scarves that I think every visitor to Scotland must buy at least one. It has to be a rule, right? 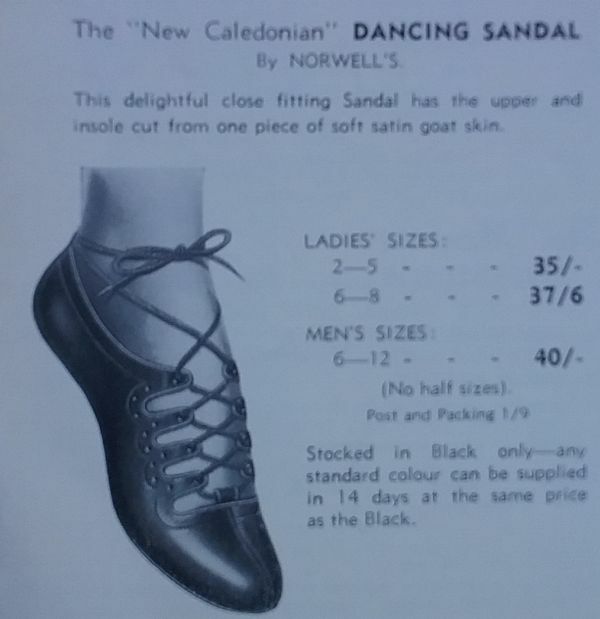 I think I need a pair of New Caledonian dancing sandals. LOVEE ALL OF IT! 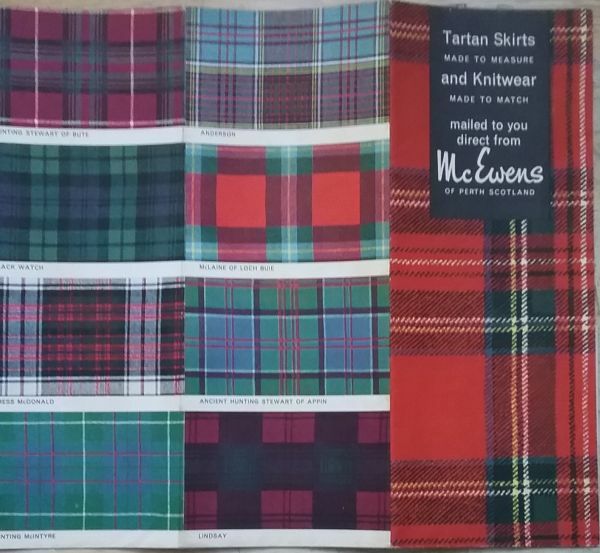 My best girlfriend is from Scotland and worked for them-we always talk about these tartans. Would love to have just a few yards of the real thing! Can’t wait to share this with her! Thank you Lizzie! You are welcome. I love a good tartan too! Had never heard of this store or their services. I had never heard of the store either, and was surprised to find such a rich history. I’ve only made three plaid items in my long life of sewing. The first was a plaid dress in junior high home ec, did not work for me. The second was a plaid wool shirt for the hubs when we were newly weds (he finally wore it out 38 years later). That thing gave me nightmares cutting it out. The fabric was on sale, but still expensive for people who were living on a bare minimum college budget, and I had to have four yards because I wanted to make sure everything matched and he was a 3X! The worst thing was an actual kilt for my oldest daughter who was in dance class. I misfigured the amount of fabric necessary so my son got the kilt, he was smaller. I’m still not sure I made it right and got the pleats the way they were supposed to be, and it’s been over twenty years now. I was sewing them down on the way to the performance. I really prefer far more forgiving fabric patterns, lol. Plaid is really hard, especially if it’s one that has an uneven pattern. Even sewing a straight skirt tried my patience! They are ghillies. I was surprised that the catalog did not call them by that name. So do I. I need that bucket bag. I love all of this, but my favorite thing might be that draw-top bucket bag. Oh, it’s mine as well! I want mine in Black Watch with a dark green leather trim. 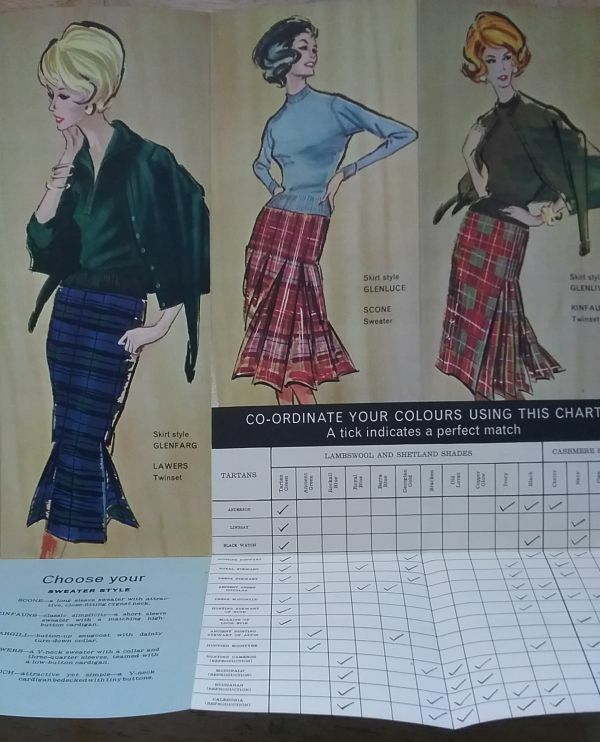 I am so in love with tartans, and always aspire to have the money to properly construct flattering skirts. Now that I’ve moved back to cool-weather climes, I put it back on my to-do list. Glad to be a help! And I’ll take the Lothian jacket in a solid color–maybe that exquisite dark blue! So happy you’re enjoying your skirt.